Undergirding the Belt and Road Initiative, is a trillion-dollar loan subvention that seeks to connect countries across continents on a trade trajectory, with China at its core. The ambitious plan involves the building of railway and road infrastructure to connect China with Central and West Asia, the Middle East and Europe (the “Belt”)and creating a 6,000km sea-route connecting China to South East Asia, Oceania and North Africa (the “Road”). Certain economic complementarities are directly responsible for the growing relationship between China and Nigeria. First, is that Nigeria is developmentally challenged given its infrastructure deficits. Secondly, China has developed one of the world’s largest and most competitive construction industries with particular expertise in the civil works, considered critical for infrastructure development. The latter when combined with China’sability to provide presumably soft loans made its expansive incursion into Nigeria relatively easy. With over $6 billion Chinese investment between 2012and 2017, Nigeria ranks secondbehind Egypt, as Africa’slargest recipient of Chinese investment. Naturally, Nigeria may well join the swelling club of Chinese debtors, of which Sri-Lanka, Pakistan, Djibouti, Maldives, and Laos are the most heavily indebted. The concerns notwithstanding, Nigeria and Chinaconcluded a currency swap agreementrecently, in which 16bnRenminbi(RMB) is to provide adequate local currency liquidity to Nigerian and Chinese businessmen. Since 2014, Chinese currency, theYuan, has assumed greater prominence in world trade with some countries considering it a global reserves currency.With the deal, Nigeria became the fourth country in Africa (after Ghana, South Africa and Zimbabwe) to sign on to Yuan for its trading and financial market transactions. China-Nigeria investment relations just like any bilateral relationship, has some advantages and disadvantages. Thus, whether the Chinese Silk Road represents Eureka or adebt peonage for Nigeria can only be determined in the near future. The pointer, for now, is on the balance and the pendulum could swing either way. An optimal outcome from Nigeria-China relationship will depend on the policies and institutions that are put in place by Nigerian authorities to maximize the complementary effects and to minimize the competing and deleterious effects. Meanwhile, China is virtually present everywhere in Nigeria,even as information about its engagement and activities remain opaque and fragmented. It would amount to folly not to monitor China activities rigorously. There is therefore, need to establish a coordinating body on China. This body, preferably a technical arm of an existing body, should be empowered to scrutinize and evaluate agreements, memoranda and any other articles of association between Nigeria and China in keeping with provisions of Presidential Executive Order No.5. The optics and narratives on Nigeria-Sino relations remains mixed. 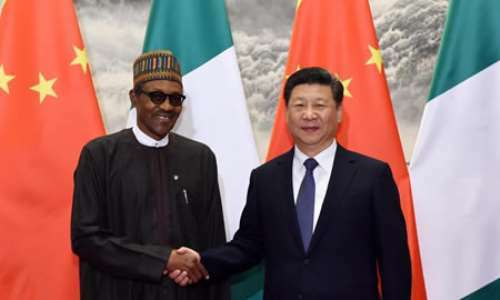 Nigeria’s economic dalliance with China has also elicited concerns outside Nigeria, including warnings from the U.S. government that Nigeria and other African countries should be wary of Chinese deals. While U.S. rebuke may not be entirely altruist, it retains some validity. Accordingly prevailing concerns that China’s incursion into Nigeria might have negative consequences in the long-term cannot be over exaggerated. Chendo is a Research Associate at Selonnes Consult; Obaze is MD/CEO Selonnes Consult in Awka.